Postcolonial Networks – Rhoda Zuk on Yatta Kanu’s Curriculum As Cultural Practice. Rhoda Zuk on Yatta Kanu’s Curriculum As Cultural Practice. Kanu, Yatta, ed. 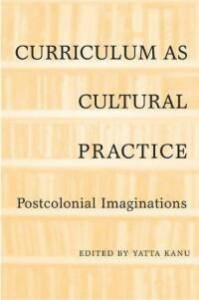 Curriculum as Cultural Practice: Postcolonial Imaginations (Toronto: Toronto University Press, 2006, 2009). This collection of essays was reprinted three years after its original publication in 2006. It is easy to see why: the book is an eminently useful introduction to postcolonial theory and its possible applications to the practice of teaching. Texts central to postcolonial theory are elaborated upon through descriptions of diverse teaching practices in a range of disciplines. Having said this, some contributions are overly general, asserting rather than demonstrating the urgent need for teachers to shape their work in accordance with postcolonial insights. This review highlights five essays that are painstakingly researched and argued and that offer a careful and exciting education in the field of postcolonial theory and teaching. Norrel A. London’s quietly forceful opening essay, “Ideology and Politics in the English-Language Education in Trinidad and Tobago: The Colonial Experience and a Postcolonial Critique,” serves as an object lesson and fitting opening to the twelve studies that follow. London meticulously documents the death of Trinidad and Tobago’s “linguistic heritage” (55)—killed by the colonial policy and teaching practice of enforcing standard English through rigid guidelines and obsessive, authoritarian supervision. The chapter makes plain the historical legacy of colonialism. While the suppression of indigenous dialects in Trinidad and Tobago was particularly dire, it is possible to generalize the implications of colonial theory and method for other nations and peoples. The stage is set to explore the work of teachers in the present as they consciously choose to work with the descendants of the colonized. John Willinsky’s essay, “High School Postcolonial: As the Students Ran Ahead With The Theory,” is an eminently witty—and moving—account of what introducing postcolonial theory to high school students might actually entail. Recounting his three-week stint as guest teacher for a poetry unit, he describes the excitement and fascination intrinsic to the risky business typical of any untried approach to a disciplinary study. His time with the grade twelve class began with a brief examination of the forty-year-old British Columbian textbook, a canon of Canadian poetry that is, from a literary historical point of view, itself an exciting, fascinating, risky project. However, by the opening of the twenty-first century, it must be adjudged stale and no longer sufficient to the day, perhaps most particularly in a highly diverse urban high school. Explaining postcolonial ideas, he sets the class the task of compiling their own, postcolonial anthology. The resulting collection represented a collage, in some ways unnerving, of aspiration, hope, despair, grief, nation, religion. In the course of the work, and in the way familiar to teachers, Willinsky was made to confront new ideas himself; to countenance, for example, the immediacy and complicatedness as well as brutality of rap lyrics. He was also off-footed by Muslim as opposed to Jewish or, say, Syrian Christian poetic expression. Willinsky concludes with a meditative analysis of how he might mine what was in the immediate sense a successful “unit;” how it might be enriched and more disciplined, while paying higher tribute to the power of distilled expression that is poetry. This is an essay in response to which any engaged teacher, of any subject, might nod in recognition: the daunting complexity of marrying theory to subject. Ingrid Johnson’s account reports the less salubrious results of encouraging five student teachers to offer postcolonial novels to their high school students. Meeting with the volunteers for several weeks, Johnson began by asking the students to read the standard text To Kill a Mockingbird, and to consider the postcolonial critiques of the work. After discussion of the merits of those arguments, she read postcolonial theories and short stories with the students. Dishearteningly, all but one opted for the default curriculum when they turned to their practica. The one student willing to engage had a confidence borne of her undergraduate education in the subject—an example, perhaps, of how the “teacher-as-facilitator” model is no substitute for rigorous and varied education in the foundational undergraduate degree. Ralph T. Mason’s “A Kinder Mathematics for Nunavut” records his research into teaching Aboriginal elementary school children in the far north. The essay is clearly rooted in a desire to address the teachers, who educate children alienated from the thinking and material context of the south. While much effort has been invested to make northern schools inviting, Grade 3 children remain anxious about mathematics. Taking as his starting point the fact that northern society is distinct not only geographically, but morally, (133), Mason outlines “ethnomathematics and multicultural” lessons for the students (136). For instance, in southern mathematics, division is premised on equal portions, whereas in the north the division of food and other goods is “equitable” rather than “equal” (136). Glen Aikenhead’s essay, “Cross-Cultural Science Teaching: Rekindling Traditions for Aboriginal Students,” observes a disharmony between Western and Aboriginal views about nature. For Aboriginal students, he argues, this difference is more than an epistemological disjuncture—it is a form of “cognitive imperialism” (223). The essay advocates a “decolonizing approach to school science” by devising a curriculum that allows children to occupy a Third Space in their learning and that is more likely to prepare children for achieving a balance of power in their relations with diverse cultural groups (224). Teachers assume roles as “culture brokers” who develop innovative, locally specific classroom practices. This purpose was achieved through a project Aikenhead undertook with six teachers working primarily with Aboriginal students in northern Saskatchewan. The research team was guided by an Aboriginal Elder, with other Elders contributing from time to time, and with the assistance of translators, technology specialists, a visual artist, and a variety of other teachers and community members. Aside from validating “a sense of place” by conducting lessons in natural spaces, students learned the protocols of interviewing knowledgeable community members about nature (232). This entailed lessons in the sacred role of story-telling in Aboriginal culture. Western science was certainly introduced, and teachers practiced “anthropological instruction”; neither Aboriginal nor Western science displaced the other, rather students were encouraged to appropriate knowledge so that each one enriched the other. What is more, teachers fulfilled the function of culture brokers by modeling the process of learning from community members. Essays of this caliber make for absorbing reading and encourage teachers (including university teachers) to take hold of needful creativity as they devise their own curricula. Rhoda Zuk is Associate Professor of English at Mount Saint Vincent University in Halifax, Nova Scotia. Her teaching and research interests include postcolonial feminist literature and theory.